Monetate Inc. has launched a new testing tool for marketers working at smaller, growing businesses, aiming to help them move beyond basic testing products and to migrate to the kinds of tools marketers use at larger enterprises. Based in Conshohocken, Pa., the company traditionally has geared its testing and optimization products towards large businesses like Macy’s, National Geographic, the North Face, and Godiva Chocolatier. But today, it announced it’s rolling out Monetate for Testing & Targeting. Essentially, the tool’s a step up from the basic testing tools marketers may already have, says Bruce Ernst, vice-president of product management. Monetate Testing & Targeting. (Image: Monetate). “The market has been relatively well-served by entry-level testing tools, sort of like Playskool or Fisher-Price-level testing tools, which help even small businesses get off to a really fast start. But a phenomenon we’ve seen over the last few years is that you get off to a fast start and you outgrow it really, really quickly,” Ernst says. With Testing & Targeting, Monetate has built in a lot of the features that have helped enterprise marketers do their jobs. For example, the tool allows marketers to reuse their campaigns. 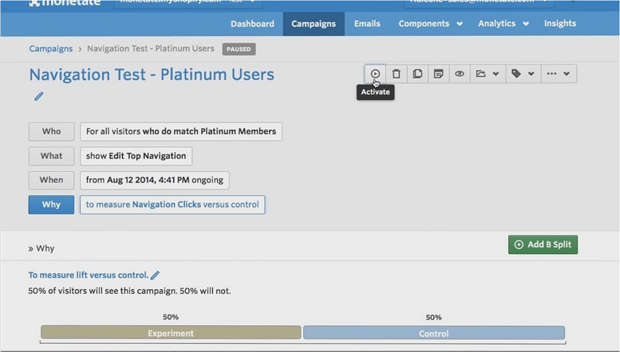 With basic tools, marketers need to run every campaign test from scratch. However, Monetate’s Testing and Targeting tool can allow marketers to run 20 different tests at the same time, allowing them to glean a lot of information about how they’re performing. What’s also useful about Monetate Testing & Targeting is its ability to help marketers streamline their workflow. Instead of having to hand over some of their work to the IT department, they can collaborate with IT, developers, creative teams, and so on. There are also options to show factors that may affect campaigns, like weather and location. For example, if a company is going to do a promotion on golf clubs, the campaign should be timed to match good weather. And in terms of showing the importance of location, one real-life example was of a pop company that had to say it was selling “soda” in its campaigns to fit with the parlance of the region it was targeting, Ernst says. The tool also comes with dashboards showing key performance indicators, as well as the ability to define and customize those indicators. However, the whole system is designed to be simple for marketers, not for data scientists, he says. Yet what’s probably most appealing is the enterprise-class security built into the tool, he adds. Pricing for the solution starts at about $1,000 a month.